Snugly tucked in between two hills at the foot of the Strážovské vrchy mountains, along the river Teplička, one can find a small city called Trenčianske Teplice. Only one and a half hour from Bratislava, my wife and I decided to take a little trip and visit this city, once famous for its Spa hotels and the annual Art Film Fest. The Strážov mountains are home to many natural thermal springs, so it comes as no surprise that Teplice is literally scattered with Spa centers. Ever since the 16th century, Teplice was considered as (one of) the most important Spa sites in the entire Habsburg kingdom, being frequented by nobility from all over Europe. One of its main attractions is in fact a 19th century Turkish bath house, Hammam, built in the Oriental style popular in the day and still open for the public. 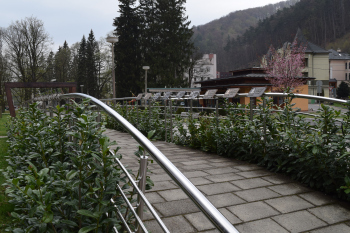 The Spa centers were not the main reason for us to pay Teplice a visit. Each summer for the past 20 years, many famous actors from all over the world have come down to Teplice to attend the annual Art Film Fest. To memorize such acting thespians like Jeremy Irons and Ben Kingsley visiting Slovakia, their names have subsequently been immortalized on the side supports of the so-called “Bridge of Fame”. As a film fan, I was intrigued by this and therefore had to see it with my own eyes. However, as intriguing the Bridge of Fame may be and as much as that was the original reason for visiting the city, it was in the end not the Bridge that fascinated me in Teplice. In fact, walking through the streets of Teplice, I somehow got a distinct feeling of nostalgia and yearning for the past. To me, what made the visit memorable, were the many buildings that have not stood the test of time. Not being able to maintain the inflow of spa visitors, tourist and film fans over the past years, the city has partly fallen into disrepair. Lack of finances and investors have resulted in the city being scattered with old abandoned bath houses that once stood proud at the heart of Europe’s spa aficionados. Once beautiful houses, bearing names like “Lipa”, “Savoy” and “Diana”, have now become mere shells of their former selves. Overgrown by the unstoppable forces of nature, windows shattered, doors still half open, untouched for many years, it almost seems as if the guests one day just simply vanished and never returned. Those buildings almost force your mind to go back in time and just imagine a Spa city, bustling with guests walking around the park, enjoying the curative waters of the thermal springs and perhaps sit down for an ice cream in one of the many ice cream parlors. It must have been a beautiful sight and a pleasure to be in Teplice at the height of its fame. On the other hand, however paradoxical, it is exactly those fallen heroes of stone that give Teplice a certain air of magic. As a student of history, it fascinates me and gets my fantasy running, imagining how life in Teplice would have been. 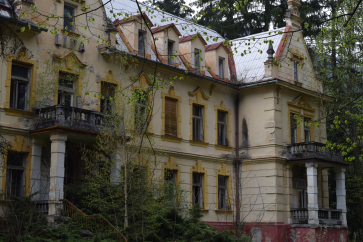 Time has not been kind on Teplice, despite its still operating spa industry. I guess the fact that the Art Film Fest, which started in 1993 and has ever since been hosted in Trenčianske Teplice, has moved in 2016 to Kosiče in the east of Slovakia, is only more reason to worry about the loss of tradition and the fading past of a once famous city. Buildings like the “Lipa” bath house and the massive socialistic “Machnač” hotel at the center of the city are to me physical reminders of a past which, without the necessary influx of investments, will remain exactly just that…the past.